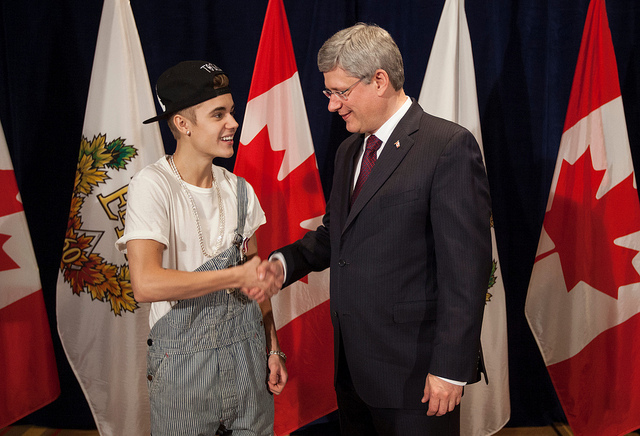 Prime Minister Stephen Harper has officially made a mockery of the Queen’s Diamond Jubilee Medal by awarding one to Justin Bieber, who in turn made the ceremony even more undignified by not having the courtesy to wear a suit. Harper sought only a nice photo-op that would garner him some positive media attention. In general, only the Governors or members of the Royal Family should award honours and medals that recognize excellence and heroism (though of course, neither truly applies in this case) because they are non-partisan figures who can undertake ceremonies without entailing any partisan-political considerations. Any public ceremony, celebration, or commemoration that involves the Crown properly falls under the domain of the Governors or to the Royals; in contrast, Ministers of the Crown and parliamentarians take responsibility for the legal-constitutional aspects of the Crown-in-Council and Crown-in-Parliament. When politicians intrude upon such ceremonies, one cannot help but ask oneself, “What political advantage does he derive from this situation?” and “what partisan calculations has he made in this case?” These questions of political calculation simply do not apply to our Governor General and the Lieutenant Governors, who represent the Sovereign. That said, I must highlight the exception to my general argument in this particularly case: I suspect that the Prime Minister, rather than the Governor General, conferred this honour precisely because we all know that the young Justin Bieber, who only recently stumbled into adulthood, has done nothing to merit such an award. If the Governor General conferred such an undeserved honour, that contrived ceremony would have embarrassed the Crown. Politicians are inherently partisan, and they should not attempt to augment their own legal-constitutional power, or their personal prestige or popularity, by cloaking themselves in the ceremonial, doling out honours like patronage, and turning the honours system into a political tool. In a constitutional monarchy such as ours, politicians may not seek the loyalty and love that only the non-partisan, non-executive Sovereign enjoys. We do and should criticize and scrutinize elected politicians constantly; these self-aggrandizing careerists may not command the citizen’s loyalty, thereby usurping the Sovereign. In a constitutional monarchy, we reserve our loyalty to the Sovereign, who personifies the Crown and thus all our liberal-democratic institutions and the country. Paul Benoit, presentation to the Monarchist League on “The Three Threats to Canada’s Constitution,” 4 October 2012. Peter Hitchens, The Abolition of Britain, interview by Brian Lamb, Booknotes, CSPAN, 20 October 2000. [accessed 1 June 2012]; Peter Hitchens, “MPs Shouldn’t Give Out Medals – That’s Why We Have a Monarch,” The Mail on Sunday, 8 September 2012. This entry was posted in Crown (Powers and Office), The Honours System and tagged Paul Benoit, Peter Hitchens, Stephen Harper. Bookmark the permalink. Stephen Harper has made a mockery of democracy as well. Hmmm…. Maybe you were the one who searched “unseat dangerous Harper” yesterday. haha no, that wasn’t me… but I’m going to now just to see what’s out there!